Holly Bunch 4up Holiday Postcards are great for sending holiday wishes to your loved ones around the world. 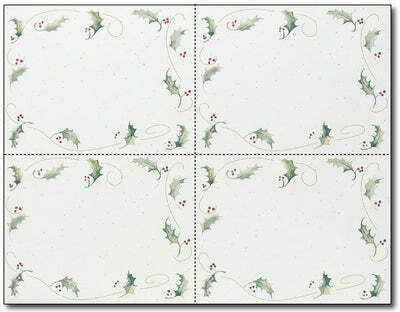 These holiday postcards measure 4 1/2" x 5 1/2" and come 4 per 8 1/2" x 11" sheet. Made from a 110lb Text cardstock, these holiday postcards are inkjet & laser printer compatible.